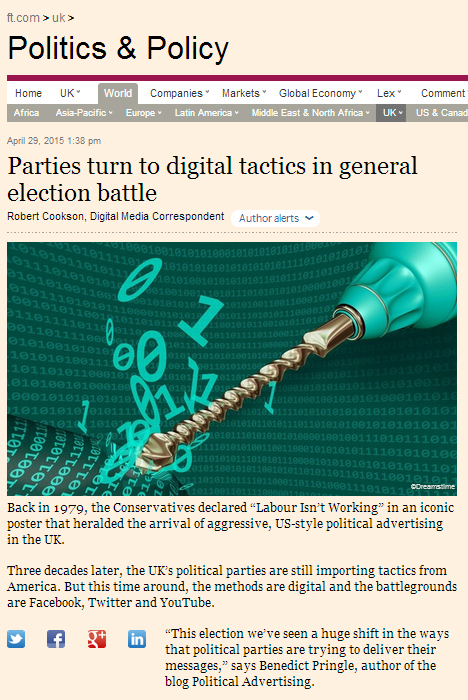 Robert Cookson at The Financial Times has written a nice article on the digital aspect of the 2015 general election campaigns. When I spoke to Robert I gave him my point of view that the scale of the paid-for digital campaigns in this election is unprecedented in the UK and that political parties – particularly the Conservatives – are getting around the ban on TV advertising by using YouTube and Facebook videos. However, pre-roll isn’t in this instance the poor relation of TV. Indeed, using paid-for online video is in many ways much better than TV as you can target internet users who display certain online behaviours or fit certain demographics. This allows parties to focus resources on the audiences and locations that are most likely to deliver them important votes. As this is a political communication innovation I suspect there will be a gut instinct amongst some to try and contain or ban it. Advertising is an important way for political parties to communicate with voters. Currently political parties have to overly rely on mass media outlets in order to disseminate their campaign messages which inevitably leads to distortion; the emergence of digital media has been an important shift in enabling politicians to communicate directly with the electorate and we should avoid any moves to curtail it. However, as a quid pro quo, the political parties should agree to a new regulatory framework around all advertising in order to prevent the broadcasting of misleading or offensive information. More detail on this can be found here. is adding to the breakdown of those local financial controls – and that’s a bad thing for politics overall (more details at http://www.markpack.org.uk/130283/internet-speeds-up-the-killing-off-of-expense-controls-in-marginal-seats/ ). Enjoyed your article. Clearly legislation around party funding, spending and messaging regulation need to be looked at again. And it should be done so with the attitude that it’s important for democracy to enable political parties to have more direct, unfiltered, communication with the electorate. And I don’t mean more party political broadcasts…!